Across a highway from the gates to the Port of Savannah, crews have cleared trees and driven pilings into the sandy soil to support bridges and a lattice of future rail lines. Though the construction site is only a few hundred feet from where cranes load and offload freight from giant cargo ships, Georgia Ports Authority officials said the project’s reach will stretch for thousands of miles and could mean billions of dollars in new trade for the state. On March 27, the ports authority held a ceremonial groundbreaking for the $126.7 million Mason Mega Rail Terminal, a sprawling rail yard GPA Executive Director Griff Lynch said will provide better connections to the main CSX and Norfolk Southern rail networks as well as provide direct access to coveted Midwestern cities such as St. Louis and Chicago. The project is expected to eventually take some 200,000 big rig trucks off the state’s freeways — even as container traffic in and out of the port grows, Lynch said. Carrying freight by train will ease bottlenecks near the Garden City Terminal and reducing truck traffic on highways across Georgia — including in metro Atlanta. The Mason rail hub is part of the state’s expanded investment in transportation infrastructure. This includes the gas tax overhaul backed a few years ago by the Legislature and Gov. Nathan Deal that is pumping about $1 billion a year into the state’s roads, as well as the ongoing deepening of the Savannah River channel, which is designed to accommodate larger classes of freighters passing through the expanded Panama Canal. At the ceremony, ports board chairman Jimmy Allgood said staff expect the completed terminal will cut rail time to Midwest cities by 24 hours, precious time that will make shipping faster and cheaper, and in turn, make Savannah more attractive to businesses. “This project is a game changer,” he said. Georgia’s inland and coastal ports are vital cogs in the state’s economy. A study recently released by the University of Georgia found that maritime trade accounts for $44 billion of the state’s gross domestic product and the ports directly or indirectly touch more than 439,000 jobs. In Savannah, warehouse vacancy also is a scant 3%, and demand for space is high, said Michael Toma, a Georgia Southern University economist. Cargo services are running larger ships and making fewer port calls, but to accommodate the larger ships means investing in infrastructure both at the harbor and on land. “If a chokepoint is between the container and the ultimate destination, time is money,” Toma said. The first phase of the Mason rail project, named for late longtime ports board member Jimmy Mason, is expected to open by fall 2019. By the fall of 2020, 18 rail lines will crisscross the yard, and gantry cranes will hoist metal boxes onto trains bound for Memphis, Chicago and other points in the Midwest. The port currently has eight rail lines on campus. The ports authority said it moved a record of nearly 4 million twenty-foot equivalent (TEUs) containers in fiscal year 2017, and the agency is working to double capacity over the next 10 years. The rail hub is a vital cog in that plan, allowing other parts of the Savannah campus to be reconfigured for future growth, Lynch said. The Mason project will be paid for largely by profits from port operations, and by a $44 million U.S. Department of Transportation grant administered by the Maritime Administration. The port can accommodate about a half-million rail lifts per year and the new expanded yards will double that figure to 1 million annually. The project will ultimately allow trains nearly 2 miles in length to be built on site, and overpasses will allow trains to bypass existing surface crossings. That will alleviate traffic congestion around the port to allow freight to be moved faster. “The great thing about rail is it is the most sustainable and environmentally friendly way to move freight,” Lynch said. 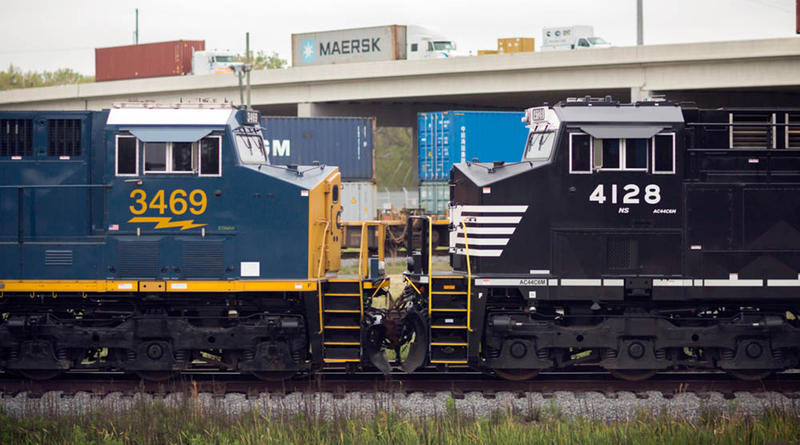 As currently laid out, the Savannah port’s rail network builds trains of about 1,800 feet in length, meaning multiple trains leave during the day and must be assembled at nearby yards into longer more efficient trains. But all that traffic can cause traffic bottlenecks in Garden City, something that city’s mayor, Don Bethune, said he is glad to see fixed. Ports across the East Coast are locked in an arms race of infrastructure spending. The state and the Army Corps of Engineers are in the process of deepening the Savannah River channel to 47 feet from 42 feet to accommodate Post-Panamax classes of ships. The deepening will allow the larger vessels to pass the channel with greater flexibility and with fuller loads. The nearly $1 billion deepening project is expected to be complete in late 2021. The rail project, Lynch said, will make the Savannah port more competitive with rivals such as Norfolk to serve Midwest cities. Savannah already accommodates about a quarter of the cargo traffic headed to and from, Memphis, for instance, and the authority is counting on the rail project to help grow that figure.